54 • ROCK products • March 2019 www.rockproducts.com LAW Henry Chajet is a partner at Husch Blackwell LLP. He provides strategic counsel to clients, to prevent or reduce risks from situations of crisis and uncer- tainty, in environmental, employee health and safety, and antitrust law matters. He also represents clients in rulemaking and legislative proceedings, as well as in investigations and litiga- tion involving unfounded enforcement actions. 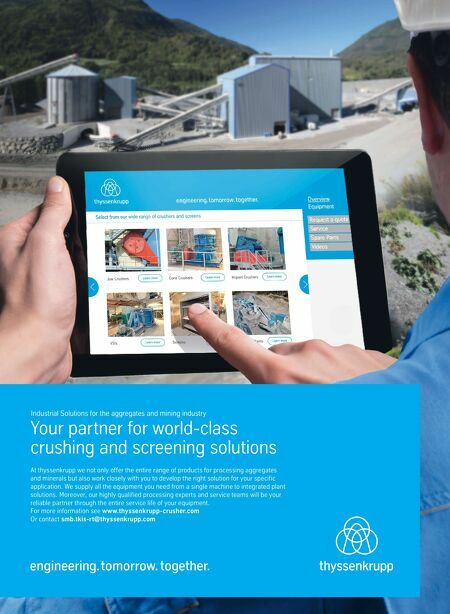 Chajet is a member of Husch Blackwell's Technology, Manufacturing & Transportation team. 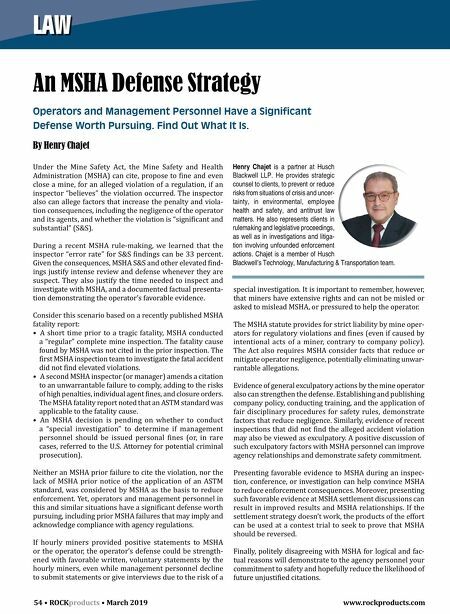 An MSHA Defense Strategy Operators and Management Personnel Have a Significant Defense Worth Pursuing. Find Out What It Is. By Henry Chajet Under the Mine Safety Act, the Mine Safety and Health Administration (MSHA) can cite, propose to fine and even close a mine, for an alleged violation of a regulation, if an inspector "believes" the violation occurred. The inspector also can allege factors that increase the penalty and viola- tion consequences, including the negligence of the operator and its agents, and whether the violation is "significant and substantial" (S&S). During a recent MSHA rule-making, we learned that the inspector "error rate" for S&S findings can be 33 percent. Given the consequences, MSHA S&S and other elevated find- ings justify intense review and defense whenever they are suspect. They also justify the time needed to inspect and investigate with MSHA, and a documented factual presenta- tion demonstrating the operator's favorable evidence. Consider this scenario based on a recently published MSHA fatality report: • A short time prior to a tragic fatality, MSHA conducted a "regular" complete mine inspection. The fatality cause found by MSHA was not cited in the prior inspection. The first MSHA inspection team to investigate the fatal accident did not find elevated violations. • A second MSHA inspector (or manager) amends a citation to an unwarrantable failure to comply, adding to the risks of high penalties, individual agent fines, and closure orders. The MSHA fatality report noted that an ASTM standard was applicable to the fatality cause. • An MSHA decision is pending on whether to conduct a "special investigation" to determine if management personnel should be issued personal fines (or, in rare cases, referred to the U.S. Attorney for potential criminal prosecution). Neither an MSHA prior failure to cite the violation, nor the lack of MSHA prior notice of the application of an ASTM standard, was considered by MSHA as the basis to reduce enforcement. Yet, operators and management personnel in this and similar situations have a significant defense worth pursuing, including prior MSHA failures that may imply and acknowledge compliance with agency regulations. If hourly miners provided positive statements to MSHA or the operator, the operator's defense could be strength- ened with favorable written, voluntary statements by the hourly miners, even while management personnel decline to submit statements or give interviews due to the risk of a special investigation. It is important to remember, however, that miners have extensive rights and can not be misled or asked to mislead MSHA, or pressured to help the operator. The MSHA statute provides for strict liability by mine oper- ators for regulatory violations and fines (even if caused by intentional acts of a miner, contrary to company policy). The Act also requires MSHA consider facts that reduce or mitigate operator negligence, potentially eliminating unwar- rantable allegations. Evidence of general exculpatory actions by the mine operator also can strengthen the defense. Establishing and publishing company policy, conducting training, and the application of fair disciplinary procedures for safety rules, demonstrate factors that reduce negligence. Similarly, evidence of recent inspections that did not find the alleged accident violation may also be viewed as exculpatory. A positive discussion of such exculpatory factors with MSHA personnel can improve agency relationships and demonstrate safety commitment. Presenting favorable evidence to MSHA during an inspec- tion, conference, or investigation can help convince MSHA to reduce enforcement consequences. Moreover, presenting such favorable evidence at MSHA settlement discussions can result in improved results and MSHA relationships. If the settlement strategy doesn't work, the products of the effort can be used at a contest trial to seek to prove that MSHA should be reversed. Finally, politely disagreeing with MSHA for logical and fac- tual reasons will demonstrate to the agency personnel your commitment to safety and hopefully reduce the likelihood of future unjustified citations.